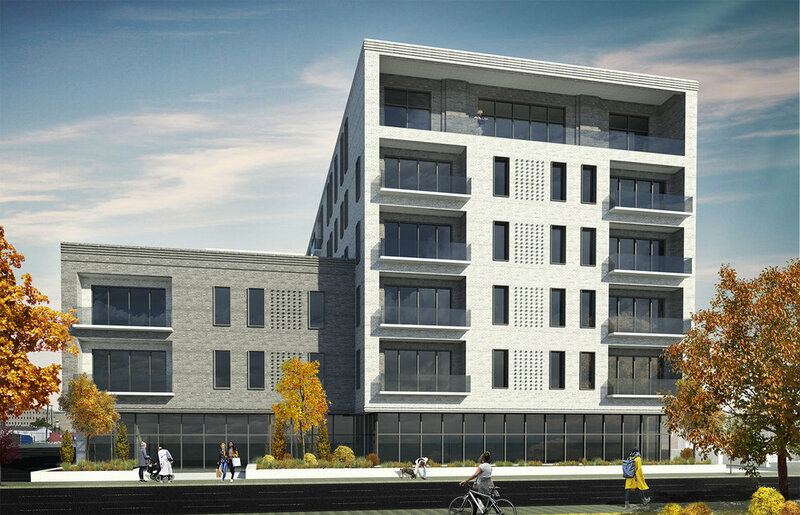 The Bluestone Apartments will be located on a tight urban plot in Downtown Columbus. The project is uniquely challenged in that it is the first of the new wave of development revitalizing the area. That said, appropriately fitting into its context became one of the driving factors for its design. Once a block characterized by single family homes and small commercial structures, the design carefully breaks down the mass of the building – crafting both a 3 and 6 story portion. The balconies, a defining characteristic of the design, are carved out of the mass instead of merely tacking on - diminishing the mass while providing great depth to the street facing façade. A transparent, active ground floor puts eyes on the street and lends to a vibrant urban environment while cleverly shielding the rear and underground parking. While a truly urban building, the design ensured there was plenty of room for green space, setting the building back enough for planters and foliage. The shorter portion, set back even farther, leaves room for trees while the low height allows sunlight to flow into the building’s courtyard, providing yet another green space. Tenant amenities will include a fitness center, party room, and a rooftop pool.